From a tip jar on a desk to an annual event with food and auction items, the Animals In Need Fund (AINF) has come a long way. It all began with the opening of the Nipomo Dog and Cat Hospital in 2008, “which was a pretty bad time to start a business,” said Robin Shroyer, veterinarian and co-founder of AINF. With so many people bringing in their sick or injured animals but not having enough money for their treatment, AINF was created in 2011 as a nonprofit to help with expenses. FUN RAISING: On Aug. 27 from 3 to 8 p.m., the Edwards Barn in Nipomo will host the annual fundraising event for the Animals in Need Fund. “We’re a nonprofit started by a for-profit hospital, so that’s pretty unique,” Shroyer said. 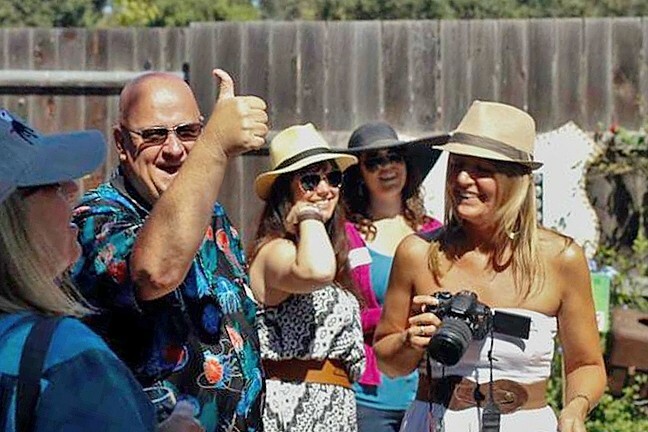 This year’s AINF event will be taking place on Aug. 27 from 3 to 8 p.m. at the Edwards Barn in Nipomo. The theme is Mardi Gras for Paws, and dinner will be provided by Tracy LaBastida, who was also the chef at last year’s event. There will be a live auction, silent auction, and dessert auction as well. According to Shroyer, these events are planned six months ahead of time. “It’s like having 250 people over for dinner,” she said. Though the annual event is when AINF does the bulk of its fundraising, it accepts donations year-round, applies for grants, and occasionally hosts smaller fundraising events as well. “We also hold a funding drive at the end of the year when people need tax write-offs,” Shroyer said. Most of the money raised is given by the Nipomo Dog and Cat Hospital in the form of no-interest loans. This allows animals to get the care they need even if their owners cannot immediately afford it, particularly when it comes to spaying or neutering. “One Sunday a month, we spay or neuter about 30 to 35 cats, and it only costs $20,” Shroyer said. According to her, they do this with cats because they are quicker and easier to spay and neuter than dogs, but AINF is hoping to expand the program to Chihuahuas and pit bulls too. Partnerships support AINF’s cause as well. Animal Services works with other local agencies on a variety of needs, such as dental care, and the Five Cities Homeless Coalition has been helping them provide for the pets of homeless people. Though their main goal is to reunite pets with their owners, in the cases where they can’t, Petco adopts out many of their animals. Shroyer said that keeping animals with their owners happens “not as often as we’d like,” and because of that AINF subsidizes microchips and puts out advertising for lost pets. Fortunately, according to Shroyer, when the animal is micro-chipped, or at least wearing tags, they are always able to return it home. Remembering all the animals that they have helped is Shroyer’s favorite part of being involved in AINF. For more information about AINF or to find out how you can contribute to the cause, visit ainfund.org or email ainfund@earthlink.net. On Aug. 9, the SLO County Jail Women’s Honor Farm donated 120 baby quilts, 100 bibs, and 50 baby beanies made by inmates to San Luis Obispo ALPHA, a nonprofit organization providing support, practical assistance during pregnancy through a child’s first year, and education on pregnancy and early parenting throughout the county. New Times Intern Katrina Borges wrote this week’s Strokes & Plugs. Send story ideas to strokes@newtimesslo.com.